Motor control is divided into three separate panes. The Motor Control pane deals with CV's for simulating locomotive weight or inertia. The Basic Speed Control pane deals with basic motor control CV's and the third Speed Table pane covers those dealing with the Speed Table method of controlling the motor. These last two methods of motor control are mutually exclusive. The selection is made with a radio button at the top of each of those two panes. 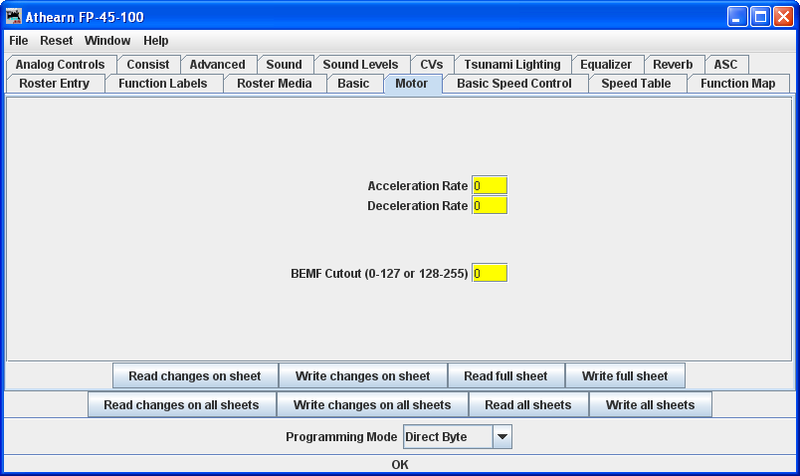 The default selection is Basic Speed Control. Acceleration Rate and Deceleration Rate help simulate a locomotive under load - but don't use them unless you have very clean track, because an interruption of power can make a locomotive stop and cycle through the acceleration curve again! On the latest Tsunami Diesel sound decoders the firmware has been changed. The decoder now returns to the last speed setting before the power interruption but it has no knowledge of where it was in the acceleration curve. So if you have been in the habit of using lots of momentum and setting speed to maximum to get the sound of a notch 8 motor, be aware that if the loco loses power for just an instant from a dirt spot on the rails, it will resume at the top speed step and appear to be running away. High deceleration rates can make station stops and switching realistic, but very challenging! Back EMF or Speed stabilization is implemented differently by each manufacturer.. See your decoder documentation for the best ways to implement these variables, and be prepared to do a lot of experimenting! However they do it and whatever they call it, you should find it in this pane.